Higher education in India is getting very expensive. If you want to do medical or engineering from a decent college, then you need a massive amount of money. For example a five years MBBS course could cost you over Rs 1 Crore; similarly engineering for one semester it is around Rs 70,000 or more. As per some recent studies, the cost of education is increasing by an estimated 15% per year. It is entirely possible that many parents in India cannot afford this luxury. They just do not have money to pay for. It’s in dire situations like these that an education loan acts as a facilitator – in bridging the gap between the amounts needed. Hence, they have no choice but go for an educational loan. What is an Education Loan & why you need this? Education loan is a special purpose loan that covers special charges related to funding your higher education by a bank. In simple terms, an education loan covers typically the necessary course fees and ancillary expenses like accommodation, examination fees, and other such miscellaneous charges. Study Tour, Project Work, etc. So these were few expenses that an education loan can pay for. Although there are many others, we mentioned an important one. Whom to approach for an educational loan? In India, most leading banks and financial institutions offer education loans for students. In fact,t most PSU banks are at the forefront of such loans which they provide at attractive interest rates. Student loans cover most of the significant and popular streams offered by full-time and/or postgraduate courses including; engineering, medicine, technology, architecture, business management, applied or pure sciences (including mathematics and statistics). Upon approval of the loan, the banks will pay the university/college/institution directly as per the applicable fee structure. Handy Tip: It is advisable to check with the bank you intend to approach for the student loan whether the course you intend to apply for is covered under their education loan portfolio. Interest rates applicable to student loans in India tend to vary from bank to bank. Each bank tends to have its own RoI depending on the applicant case history and the loan amount in question. Usually, the final rate of interest applicable is the sum of the total base rate and the loan markup and falls within the bracket of between 8.3% and 12.25% per annum. As per the standard procedure followed by most banks, the interest rate on study loans are usually calculated at a simple basis during the moratorium period (repayment period). Post the completion of the moratorium period; the interest is then compounded for the balance period. 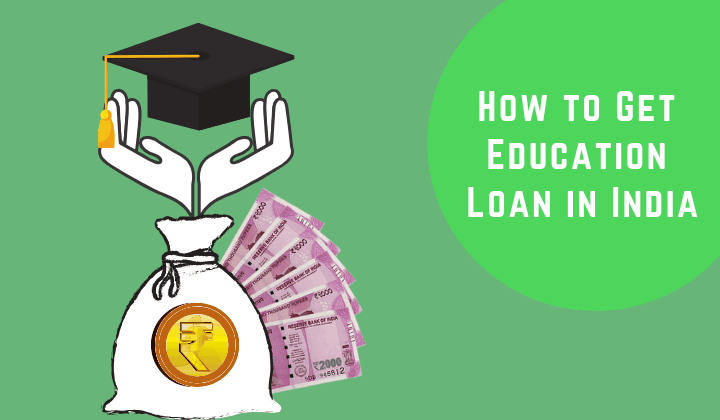 There are several ways a student applicant can negotiate to reduce the rate of interest being charged on his/her student loan and save lakhs in the process. Talk to your university/college to find out about specific lenders who would be willing to negotiate on the terms of the loan. Alternately you could discuss about existing various pre-approved loan process to get a lower interest rate and more flexible repayment terms. If you intend going abroad like say to the US or UK, for your further studies, you could negotiate a favourable deal if the currency rates are in your favour. You also have the option of applying for a student loan on campus after completing the registration formalities at your chosen institute/college. You may also be allowed better terms if you or your family happen to be on good terms with the bank branch manager. Usually, unsecured educational loans above INR 4 lakh, come with a high interest rate. This can, however, be lowered significantly if you are in a position to provide some security against the loan amount. Here in this section, we shall debate about basic eligibility criteria for getting an education loan. The applicant should be an Indian citizen and above 16 years of age. There is No upper age restriction (as per RBI guidelines). However, some banks do have it. He/She should have secured admission to a college or university which is recognised by a competent authority in India or abroad. Loan amount could differ because of various factors like the kind of courses you choose, and you are studying in India or elsewhere. The loan for education within the country could be in the range of INR 10-12 lakhs, while it is considerably higher (INR-20-50 Lakhs) for an overseas educational, depending on the course. Below INR 4 lakh (no guarantor is needed). Between INR 4-7.5 lakhs (third-party guarantee may be needed). Above INR 7.5 lakhs. (Collateral required). If you are going for management courses like MBA, engineering, medical etc. then you need a higher amount because the cost of the course is high and the chance of employability is greater. Other hand courses like MA, BA, or B.Sc cost less. India or Abroad: If you want to study in India then the loan amount is less but if you’re going to study abroad the expenditure is higher. In this section, we will see what all you need to get an education loan. We look at things like courses, institutes, documents, assets and other things. Courses: You must go for individual courses if you want a study loan. Graduation Courses: BA, B.Com, B.SC, M.SC, MA etc. Professional Courses: Medical, Management, Engineering, Agriculture, Law, Dental, Computers etc. Institutes: You must be studying in following institutes. Courses must be provided in Institutes like IIT, IIM, IISc, NIFT, regional Institutes etc. Now you know about the courses and institutes that you need to study in it is time to collect all the documents required for getting a quick student loan. You need to submit these documents in the bank. Mark sheet of the last examination you qualified like 10+2. For proof of age, you need a matriculation certificate. Admission letter from the University or Institute you want to study. Now you need a letter from your university mentioning the tuition fees, semester or year wise, the cost of living like hostel and number of years you want to study. You need two passport size photos. Bank Account statement (of the co-applicant) for at least 6 months. Income Tax Record (of the co-applicant) for last 2 years. So these were some documents you need. For security, you need other documents related to your assets. We discuss this in the next paragraph. For Security Tell Your Assets: Now for the loan, you need to submit liabilities and assets as security. For a statement of liabilities and assets you need. Any other asset equal in value to the loan amount, documents must be submitted to banks. So for collateral or security, you need to have the documents mentioned above. Transferring Amount to the University: After submitting your security and other statements bank may approve the loan amount. You can ask your bank to transfer the money to your university account or ask the bank to give a Demand Draft in favour of your college. You need to ask for two demand drafts. First one is for the college fees in favour of your university. Second is for your personal expenses like hostel fees etc. If they give one Demand Draft, then it becomes tough for students because they do not get their part of money other than college fees. Hence always ask for two separate DDs or traveller check. How to repay your education loans? The loan repayment process generally begins after the completion of the course/degree. Some banks offer students a grace period of up to six months after they find a job or up to a year after the completion of the said course to commence the repayment. The repayment period for an education loan is generally between 5-7 years. However, this can be extended by a bank, under specific conditions. Banks usually charge simple interest on the loan throughout the repayment period. This lessens the Equated Monthly Installment (EMI) burden on the student with regard to future repayments. You need to get a good job in case you want to pay your college debt or loan. So this was a concise guide for an education loan in India.